I'm not an overly generous dispenser of four- and five-star reviews but when a book moves me emotionally or intellectually (the latter, in this case) it must be acknowledged. 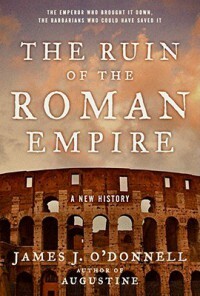 James O'Donnell's The Ruin of the Roman Empire is a brilliant (if flawed) look at a critical moment in the evolution of Western civilization that moves the reader to reassess their understanding of the period. The primary thrust of O'Donnell's arguments is that what we call "the Roman Empire" didn't fall to barbarians but was brought down by the ignorant and foolish policies of its emperors - most especially Justinian (whose epithets in this volume include "arrogant," "indecisive," "rash" and "dumb"). The author attempts to make the case that, if we could go back to the fifth and sixth centuries, often we would be hard pressed to distinguish Roman from barbarian (and the distinction would have been meaningless, anyway, to the men in question). The poster boy for O'Donnell's thesis is Theodoric, the "king of the Ostrogoths" from 471 to 526. He was the son of an Arian general and a Catholic (or, perhaps better, orthodox) mother; raised and educated at the imperial court in Constantinople; and didn't see his "people" until 471, when he was 18. Note that O'Donnell is careful not to identify any of the actors in this drama too closely with the traditional labels. Even distinguishing Theodoric's parents by religious creed is problematic at a time when all identities were in flux. The author argues that the emergence of a "Gothic" identity or a "Frankish" one was driven by Rome's unwillingness to accommodate barbarian desires for assimilation into the Roman system. The men and women Theodoric led were Heruls, Scirians, Suevi, Romans, Greeks, even Syrians; it was only in the furnace of Justinian's attempt to reconquer the West and historical hindsight that an Ostrogothic Kingdom emerged (however briefly). The important point here is the word "Augustus," a title reserved to the emperor alone by this time. Neither I nor (I think) O'Donnell would claim that Theodoric claimed imperial honors but the presence of this man's dedication indicates how Italy viewed the man who ruled them and what they expected of him. The author suggests that the examples of Theodoric, the Goths in Provence and Spain, and the Vandals in Africa were leading toward a new Roman "commonwealth," a reordering of the empire as profound as the reorganizations the marked the change from Republic to Principate at the beginning of the Christian era, and from Principate to Dominate at the end of the third century. All three factors are related and this review can hardly do them justice. An example of the first factor, is the divisive nature of imperial intervention in religious doctrine. What often was academic distinctions of no substantive effect on fundamental dogma rapidly became poles around which opposition or support of imperial policy focused. Under circumspect and tactful rulers like Theodoric and Anastasius (emperor from 491-518), a delicate balance was maintained. Under an "ignorant peasant" like Justinian, who saw any variance as a threat to imperial stability, firm lines were drawn between Chalcedonians, Arians, monophysites and any other number of creeds; compromise became difficult and, ultimately, impossible. The second factor - the unity of the Mediterranean basin - is interesting as O'Donnell argues that Rome's imposition of that unity was a fluke and only endured so long as Rome faced no serious, socially advanced polities along its borders. A situation that was beginning to change in the fifth and sixth centuries (for a more detailed analysis of this phenomenon, I would recommend Peter Heath's Fall of the Roman Empire). Internally, the empire was a collection of highly disparate regions: the hellenized, urbanized East, where there was a three-millennia-old tradition of culture; the Balkans, characterized by O'Donnell as the empire's "Wild West"; the Mediterranean provinces of the western empire (south Gaul, Spain & Africa), hellenized to the extent that its few urban centers were Greek and/or Punic in origin but otherwise only superficially urbanized; and the frontier provinces in north Gaul and the Rhine and Danube valleys, where Greco-Roman culture was represented by vast estates, cities were essentially military camps, and most lived lives little different from the tribes Caesar had conquered half a thousand years previously. The "Great Satan" of the sixth century, however, the man who put paid to the continued existence of a Roman Empire and Mediterranean unity, is Justinian, who reigned from 527-565, but probably ruled for much of his uncle's preceding regime as well (518-527). I first encountered Justinian in the pages of L. Sprague de Camp's novel Lest Darkness Fall, and it was not good first impression. In this alternate history, Martin Padway (or Martinus of Padua, as he's known in Theodoric's Italy) is transported from modern Rome (c. 1950) to Italy soon after Theodoric's death, on the eve of Belisarius' invasion. In order to preserve peace and stability in Italy and, thus, his own life, Martin proceeds to "invent" U.S.-style political campaigns, paper, a printing press and the heliograph, and suborns Belisarius and his troops to the Gothic cause. Justinian doesn't come off at all well since he's willing to devastate Italy for the impossible dream of restoring the old empire (kind of like the Vietnam-era idea of "destroying the village to save it"). O'Donnell clothes that fictional Justinian with the facts of history. In 518, Anastasius left a full treasury and a relatively stable political situation but Justinian's and his uncle's ill-considered, blundering and expensive policies bankrupted the empire, alienated and polarized opponents, and broke the military. The results were ruined provinces in Italy, Spain & Africa; a powerful Frankish state in northern Gaul; crippling divisions between monophysite and orthodox; and the seeds of a ruinous war with Persia that would leave both empires prostrate before the looming Arab jihad. The are just examples of some of the themes O'Donnell explores in this well-written, provocative book. Before I end this review, I should mention what I consider the weakest part of the volume. From the beginning, O'Donnell has been arguing that we need to divest ourselves of misleading labels and the misconceptions of 2,000 years of historiography and place ourselves in the minds of the period's contemporaries (as much as that's possible). Yet, in the final chapters of the book, I think he falls into that trap by imputing motives to Cyrus, Alexander, Augustus and any other conqueror to unite the world in a peaceful commonwealth of diverse communities. Perhaps I'm too cynical, but in my reading, I've never found a conqueror or statesman who acted from such high motives. They may have had strategic visions (a position I'll grant to Augustus, certainly) but more often than not they were simply greedy megalomaniacs (Alexander) or trying to achieve "top dog" status and protect themselves against enemies (Genghis, perhaps?). Whatever benefits resulted from their conquests were recognized and justified in hindsight.